During my summer academic break, I was motivated to begin a new project that would help teach me skills in order to benefit the pursuit of my degree. YouTube was often where I would seek new ideas. The tinkering community is vast and there are hundreds, if not thousands, of great projects. Frequently, I came across videos pertaining to Nerf blasters. Not even knowing the modding community existed, I was shocked to see the electromechanical and engineering aspects used when users would improve their blasters. Because I already had many of these stowed away from when I was younger, I was eager to get started on a new project following the idea of creating a “grown-ups” version of the classic toy. The blasterI chose to start with was the Nerf Rival Phantom Corps Hera MXVII-1200 Blaster. I liked the ergonomics of the blaster and that it was big, yet not too big to pull out from behind my desk if I happened to find myself in a spray of soft rubber darts. The concept for this project started before I even had the blaster itself. 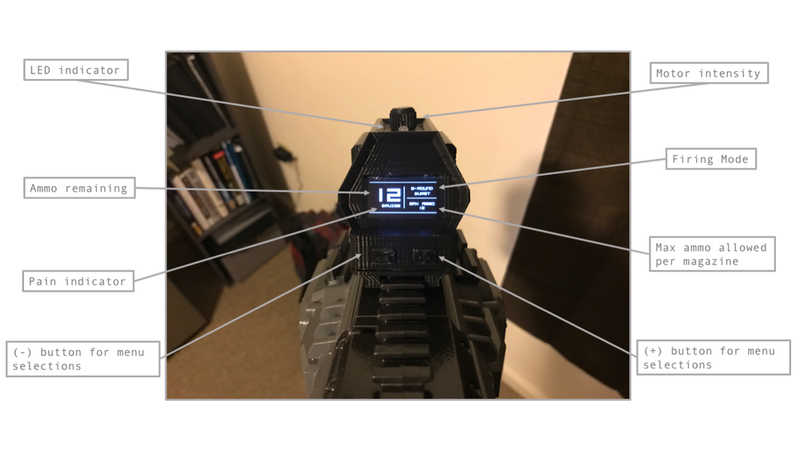 By laying out a breadboard of all the circuitry that I wanted to incorporate, I was able to fully program the entire Arduino Nano before placing it inside the blaster. I wanted the blaster to include an option to change firing modes and motor speed, the ability for the user to change useful parameters, and a screen to give helpful feedback. Also, I wanted the blaster to shoot faster. By increasing the output of the flywheels through a larger 11.1V LiPo battery, the motors would see a significant gain in power. An original gutted view of the blaster before modification. This was soon to be filled with wires, electronics, and a new coat of paint. 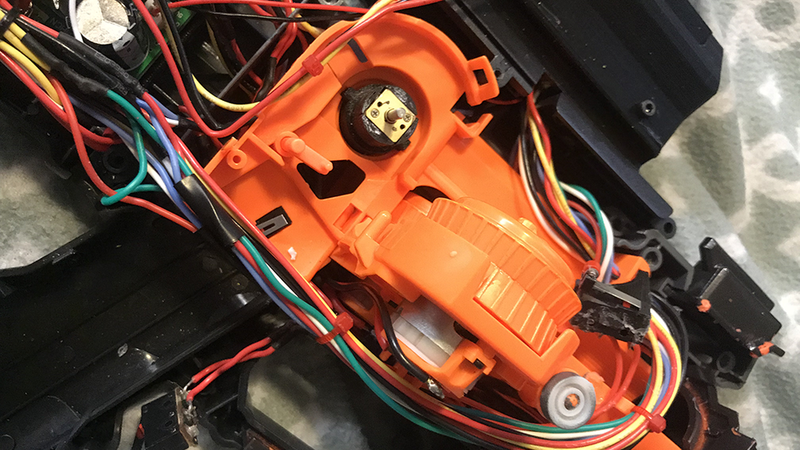 By laying out all the wiring in a non-permanent state, it proved to be an efficient way to make any changes before they were permanently soldered. As expected, there were a couple of minor issues with my circuit to begin with, but they were easily fixable since everything was at my fingertips and still in its temporary state. Each button simulates a SPDT switch that will be inside the blaster. One switch controls the motor relay, while the other four control the trigger, firing mode, and menu selection for the LED display. 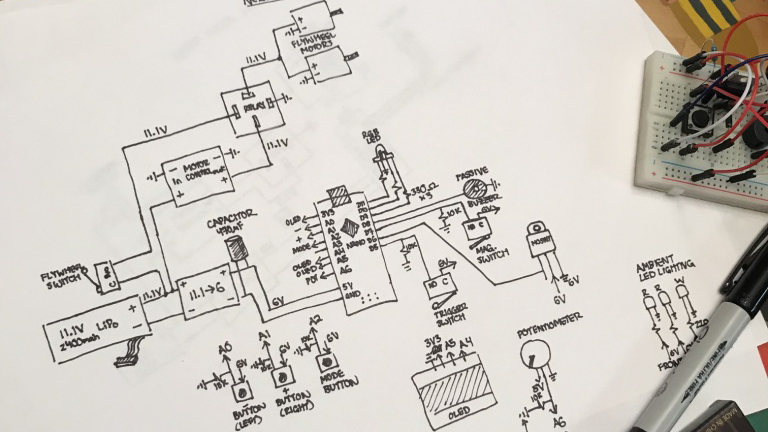 In order to record the circuit for the blaster, a wiring diagram was needed. Although this is not the most formal diagram, it was useful using representations that reflected the blaster instead of conventional circuit symbols. Next on the list was the paint and because my favorite colors on any device tend to be a dark grey or black, I knew exactly the direction I was going to go: a dark slate grey for the body and a black “hammered look” textured coating for the handle. For priming the plastic before paint, I used a very sticky adhesion promoter typically used in automotive applications. This ensured that if the blaster were to be dropped, it would not chip the finished coat. Once the paint was complete, I began 3D printing. Many additions to this blaster were made through 3D printed parts such as a battery holder, switch mounts, knobs, and spare magazine clips, to name a few. The hardest among all of the parts to design was the feeder wheel. Essentially, this Nerf blaster works by using a spring-loaded magazine to push balls into a spoked wheel. In between each spoke is a gap that is sized to fit exactly one ball. This feeder wheel scoops the balls out of the magazine and into a pair of flywheels where the dart gains its velocity. For the feeder drive mechanism, I used a geared-down N20 DC motor. With a custom 3D-printed part, it fit perfectly inside the previous enclosure. The reason for this part being so complicated to design was because of its tendency to jam with the full auto-upgrade I incorporated. These are a few iterations of the feeder wheel I had designed in OnShape. I am still currently working on a wheel that is 100% jam-free. It was difficult to find a median between the blaster jamming due to the motor spinning the wheel too fast, or because it was moving too slow where balls were being pushed into the mechanism by the spring too quickly. The feeder motor in its position. This iteration allows only one ball to be fed per revolution. Another key 3D printed part that was the display module. For the blaster, I wanted the user to be able and give inputs to certain parameters such as: flywheel speed, feeder wheel speed, and firing modes. 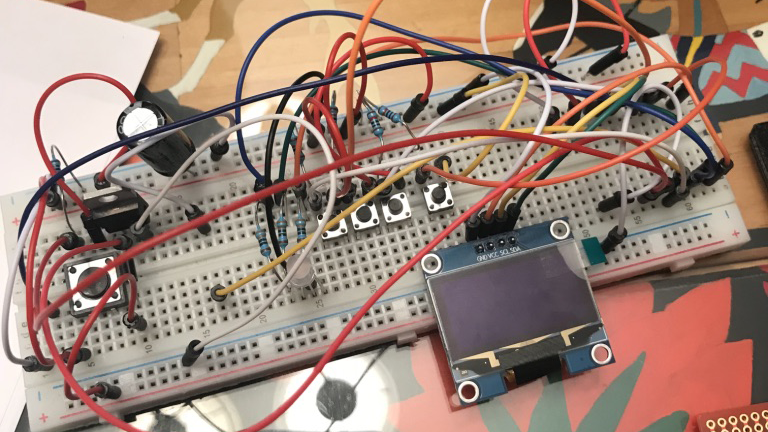 The flywheel speed would be adjusted by a potentiometer linked to a high-current motor driver circuit and the firing mode and feeder wheel speed would be adjusted using the interactive OLED display mounted inside the display module. This part took many attempts to print because of its difficult geometry. Although it still experienced a slight amount of warping at the top, using high density support as well as slow print speed created a great looking part. Since the blaster did not have a driven feeder wheel to begin with, I needed a signal for if the trigger is pulled, it would activate the motor. This was done using a simple circuit using two SPDT switches in series. The first switch was already incorporated into the blaster which would activate the flywheels “on” or “off” to propel the darts. Because I did not want the feeder wheel to come on when the flywheels were not, the only time the motor will activate is when the flywheels are moving as well. Using a custom mount and paddle, the switch worked flawlessly in its shown position with no lag after the trigger is pulled. With all the vitals in place, it was time to button everything back together. In the future, I plan to purchase smaller gauge wire and rewire the entire blaster. Although it is doable, it is very hard cramming everything in to screw the shell on. I made the mistake of not accounting for the wire size in the initial design. The blaster was now complete. Note that my first attempt at putting this blaster together did not go as planned. I had to take it apart soon after due to a problem with my electronics. Although the changes that needed to be made were very minor, it proved that spending extra time in the design process is very beneficial compared to down the road when the product is finished. Overall, this build was a perfect for my electromechanical design experience. There were a lot of obstacles I had to solve along the way and I look forward to improving my design with future iterations. After all, there is always a way to do it better. A new battery holster is currently in the works to hold a 14.8V battery instead of an 11.1V.